This seam is to be found on block 69 of the I dropped the button box Quilt. 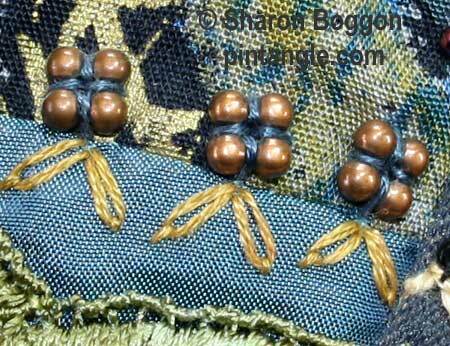 I stitched down 3 copper coloured beads and added two detached chain stitches to the base. I used stranded cotton floss. Are those beads actually clusters of four balls? Anyway, they are very pretty, especially with the colour combination. There is always so much to see on your seam details. Thank you for all the inspiration.